The death of the King Edward the Confessor in January 1066 caused a succession struggle across northern Europe, with several contenders willing to fight for the throne of England. One such claimant was the King of Norway, Harold Hardrada, who arrived off the north coast of England in September with a fleet of 300 ships packed with around 11,000 Vikings, all anxious to help him in his endeavour. Hardrada’s Viking army was further strengthened by forces recruited by Tostig Godwinson, bother of Harold Godwinson, who had been selected as the next King of England by the Witenagemot (King’s councillors) following Edwards death. The Viking armada sailed up the River Ouse and after a bloody encounter with Morcar, Earl of Northumberland at the Battle of Fulford, seized York. King Harold Godwinson now had a dilemma; whether to march north and confront Hardrada before he could consolidate his hold on Yorkshire, or to remain in the south and prepare for the invasion he was expecting from France by William Duke of Normandy, yet another contender for the throne. A man of action, King Harold’s Anglo-Saxon army travelled from London to York, a distance of 185 miles in just 4 days. Hardrada’s Vikings had no idea what hit them! Caught completely by surprise, on the morning of 25 September the English army swept swiftly downhill straight into the enemy forces, many of whom had left their armour behind in their ships. In the fierce fighting that followed both Hardrada and Tostig were killed, and when the Viking shield wall finally broke the invading army were all but annihilated. Only 24 ships from the original fleet of 300 were needed to carry the survivors back to Norway. 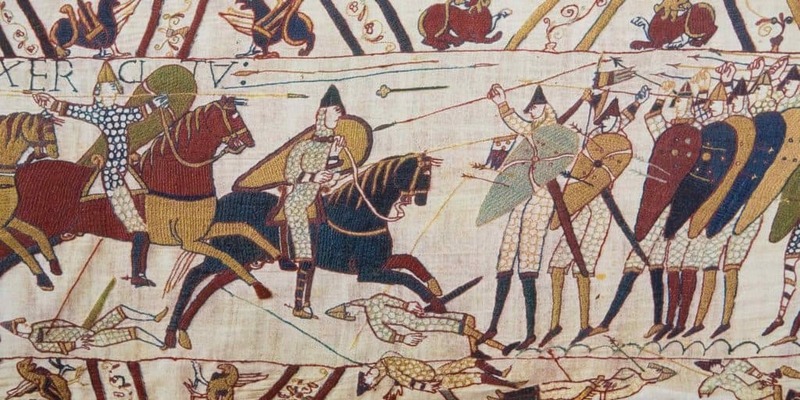 Just 3 days later, William the Conqueror landed his Norman invasion fleet on England’s south coast.